Every dog owner knows that along with the joy can come the stress and frustration of behavioral problems, which are expensive to diagnose and treat. Enter Kim Brophey, award-winning canine behavior consultant. Using cutting-edge research, Brophey has developed a groundbreaking system that allows owners to identify what their dog is struggling with, why, and how they can fix it. 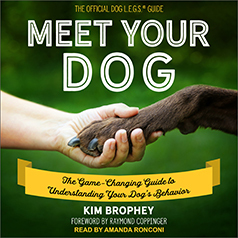 Brophey's approach is unlike anything that has been published before and will give dog owners a new understanding of what motivates and affects their dog's behavior. Brophey's innovative technique rethinks the way we categorize dogs, and distills information from over twenty scientific disciplines into four comprehensive elements: learning, environment, genetics, and self.